Rediscover the popular musical, The Phantom of the Opera at Wicked Jackpots with Universal Monsters: The Phantom’s Curse Slot. Developed by NetEnt, the game revolves around a unique love story between a soprano singer named Christine Daaé and a phantom called Erik who also happens to be a musical genius. The latter lives in the subterranean world under the Opera Populaire. Join the story too in a huge opera hall where you can also find transparent reels. Various symbols are thus available such as the Phantom, Mirror, Christine, Ring, Dagger, Yellow Flower, Heart, Spade, Club and Diamond. Try your hands at this game on any device! Immerse yourself in the dramatic atmosphere of Universal Monsters: The Phantom’s Curse Slot by placing your bets. With the + and – buttons on the Coin Value and Level displays, you can easily adjust your stake. When you click on the Max Bet tab, you can pick the highest betting amount. Launch a specific number of games you can enjoy hands-free with the Auto Play feature. Bet Levels: Select a maximum of 10 bet levels. Amount of Paylines Selection: As for the 40 paylines, they are all fixed and cannot be adjusted. Coin Values: Several coin values are available such as £0.01, £0.02, £0.05, £0.10, £0.20, £0.50 and £1.00. Delight in discovering the innovative features of Universal Monsters: The Phantom’s Curse Slot! For instance, when an Unmasked Stacked Phantom appears 2 positions high on reel 1 together with a Stacked Wild Mask on the 5th one, the Masked Phantom Re-spin feature is activated. All the Wild, Phantom and Bonus symbols remain intact for a free re-spin during which all of them turn into Wilds. 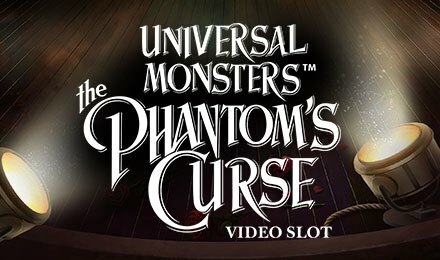 Have fun with the Point & Click Feature on Universal Monsters: The Phantom’s Curse Slot! The Unmasked Stacked Phantom on reel 1 and a stacked Christine symbol on reel 5 help to trigger this feature. It consists of a picking game coming with 2 stages. During the first stage, choose any of the 8 roses to earn coin wins until the blocker activates the next one. During the second stage, select any of the 3 mirrors to win a maximum multiplier of 3x. With this round, you can expect a maximum of 7200 coins. The lovely Chandelier on Universal Monsters: The Phantom’s Curse Slot plays the role of a Scatter which initiates the free games. Make the most of the Free Games feature triggered with 3 scattered Chandeliers on reels 1, 3 and 5. An unlimited number of free spins is awaiting you! You will notice that each reel is connected to the arm of a chandelier during this round. When the Masked Phantom lands on a reel, the latter is highlighted. When all reels are thus highlighted, the round ends. Here, the Masked Phantom acts as Wild and shows as stacked on any highlighted reel. You must have seen the Mask icon on Universal Monsters: The Phantom’s Curse Slot! It is the main Wild symbol which replaces any others apart from Scatter in a winning combo. Enjoy a spooky, yet romantic love story while playing Universal Monsters: The Phantom’s Curse Slot at Wicked Jackpots.